Hello. This is Kumiko reporting from the suburbs of Florence, Italy. Energy efficiency has become a concern in Italy because electricity is supplied from other countries and the rates continue to rise. Many people are also becoming more eco-aware and are striving to save energy by replacing traditional light bulbs with LED lighting. Let's begin our report on how my family is replacing the light bulbs in our Italian home. We just purchased two types of LED bulb of different sizes for our home. The E27 bulb, called Nostalgic Clear in Europe, produces a warm and soft glow, while the E14 bulb provides stronger, more direct lighting. 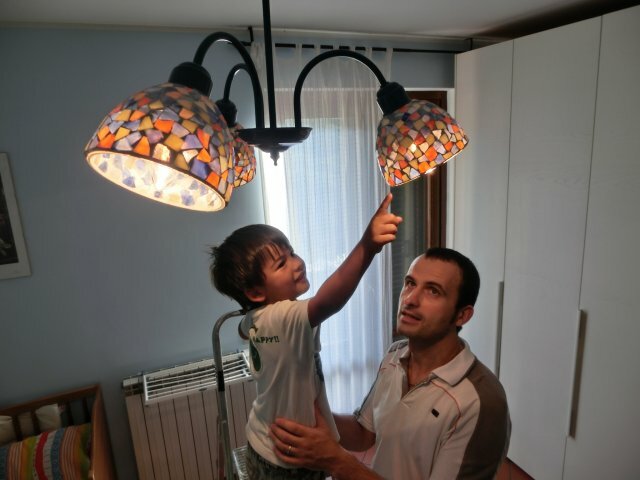 My husband Massimiliano will replace the bulbs himself today. Our lights currently use low-consumption fluorescent bulbs that were popular about five years ago. First, we will change the floor lamp in the living room and the lamp over the dining table. Our eldest son, Yuri (7), and second son, José (4), are coming over to see what their father is up to. Like many stores these days, our local electronics retail store displays wide-ranging LED bulbs. We purchased two types of LED bulb: The E27 Nostalgic Clear bulb on the left and the pointy E14 candle-type bulb on the right.